Lightning strikes the Eiffel Tower in 2010 (Photo: Carter's News), available at http://l.yimg.com/bt/api/res/1.2/ZSu7kFtt_ESLwfAKBGm1qw--/YXBwaWQ9eW5ld3M7Zmk9aW5zZXQ7aD00NDU7cT04NTt3PTYzMA--/http://media.zenfs.com/208/2011/09/01/001CATERS-EIFFEL-TOWER-LIGHTNING-01_211914.jpg. 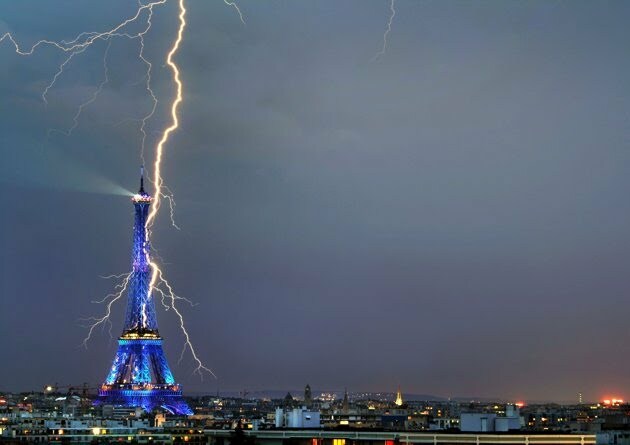 Coincidentally, the next year, a photographer captured lightning striking Prague's copy of the Eiffel Tower on Petřín (see below). On 20 May 2011, lightning struck the Petr(ín Tower in Prague. The photographer, Magdaléna Straková, has posted a few other photographs of lightning that evening at http://www.photomls.cz/2011/05/blesk-uderil-do-petrinske-rozhledny-lightning-strikes-petrin-tower/. One is more spectacular than the other. The Czech Press Agency (C(TK) as well as several foreign news outlets have reprinted this stunning photograph. 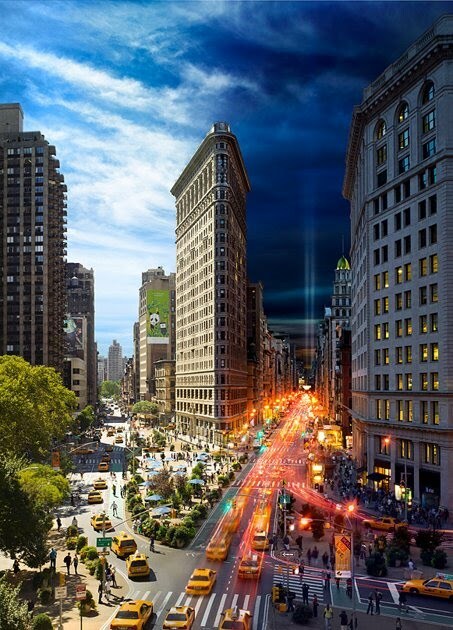 Stephen Wilkes photographed the Flatiron Building in Manhattan over the course of 15 hours and then combined the images to produce this stunning photograph. All of his "Day to Night" photographs are available at http://www.stephenwilkes.com/. It also is available at http://news.yahoo.com/photos/snapshots-week-of-june-3-1307133161-slideshow/003stephen_wilkes_flatiron-photo-1314306114.html. The Flatiron Building, completed in 1902, is one of the iconic works of Daniel Burnham (1846-1912) and his associate, Frederick P. Dinkelberg (1858-1935). 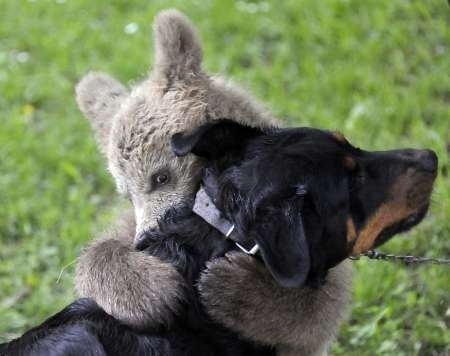 In the spring of 2011, a Slovenian family adopted a bear cub that wandered into their back yard and befriended their dog. More pictures are available at http://beta.news.yahoo.com/photos/family-adopts-cub-1306952534-slideshow/bear-cub-medo-plays-logar-family-dog-podvrh-photo-165630480.html.